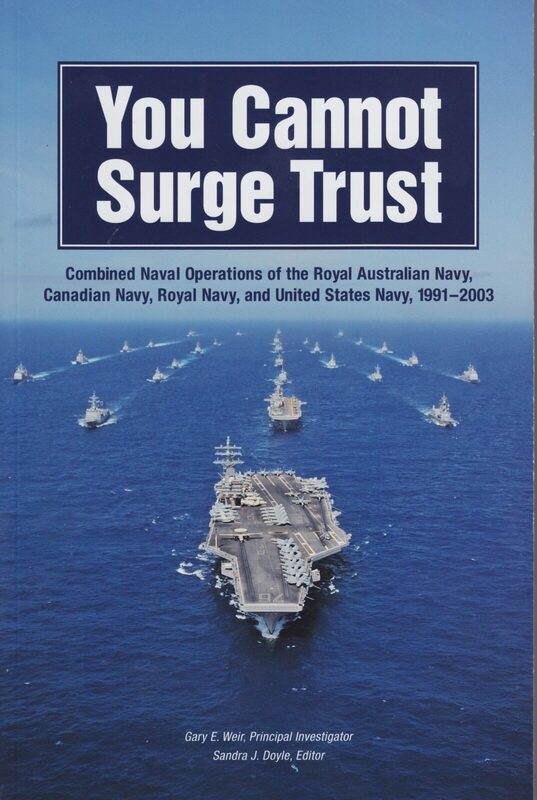 This impetus for this remarkable work began in 2003 when historians at the (then) Naval Historical Center (now the Naval History & Heritage Command) began considering the role of coalitions in warfare in light of the recent invasion of Iraq. 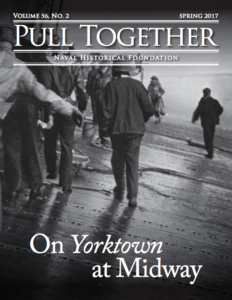 These discussions eventually expanded into a cooperative effort between historians of four navies on three continents examining their combined naval operations since the end of the Cold War. 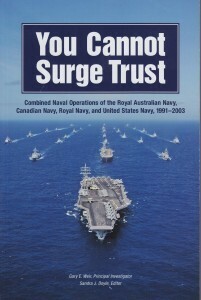 The result of this effort, You Cannot Surge Trust, includes seven case studies of coalition naval warfare, an introductory essay, and two concluding essays. Throughout the volume, the authors emphasize the role of relationships and trust in determining the success or failure of coalitions. While technical arrangements and standardized equipment enable naval forces to “talk” to one another, this work repeatedly demonstrates that personal relationships and familiarity are the indispensable glue of coalitions. Randy Papadopoulos’ opening essay outlines the means through which navies develop interoperability: doctrine, rules of engagement, joint exercises, and technical standardization. In recent years, the U.S. Navy’s rapid advances in communication technology have presented a challenge to its partners because they must repeatedly purchase expensive, upgraded equipment to stay abreast of Americans. The introduction also sets forth the rationale for studying these specific navies: they display a unique level of interoperability amongst navies and militaries worldwide. Jeffrey Barlow’s chapter discusses U.S. Navy maritime interception operations in the Persian Gulf from 1991 through 2001. The Navy enforced an embargo against Iraq using a loose coalition with multiple operational areas that gradually came under U.S. Navy control. Barlow introduces a theme that crops up in several essays: the uniquely American contribution of command, control, and intelligence capabilities to naval coalitions. Stephen Prince and Kate Brett’s chapter on the Royal Navy’s contribution to Operation Sharp Guard off Yugoslavia in the early 1990s analyzes the complications caused by the presence of two naval coalitions: one NATO-led and the other organized by the Western European Union (WEU). Prince and Brett demonstrate that the use of NATO communication standards as well as regular drill and exercise played a key role in integrating these two command structures. By 1995 the British, French, and Americans were coordinating carrier deployments to the Adriatic and regularly engaged in cross-decking helicopters and aircraft from one carrier to another. In the third chapter, Randy Papadopoulos shows how the U.S. 6th Fleet’s contribution to Operation Sharp Guard was enhanced by the dozens of multinational exercises the Fleet performed each year. The coalition also successfully completed a workable solution when the U.S. Congress tried to limit the role of the 6th Fleet. The U.S. contribution to the coalition was most notable in niche areas: nuclear submarines, maritime patrol aircraft, and coordination of surveillance data. David Stevens’ account of Australian-led operations in East Timor notes that the naval component of the intervention force provided a strong multinational show of strength. The amphibious ships and auxiliaries of the force played indispensable logistical roles, while the warships’ showers, galleys, and email access gave the ground soldiers a hotel-like break from their duties. Stevens also highlights the benefits of Australian efforts to develop ties with other Southeast Asian militaries, an important reminder for other nations to consider the regional context of coalitions. In the following chapter, Papadopoulos takes on the U.S. Navy’s contribution to the East Timor operation. The chapter demonstrates how American domestic political considerations served to limit American naval presence. The American contingent faced substantial logistical challenges, in part because of the Navy’s limited presence in the area. This chapter and the previous one work well together in that they provide different perspectives on the same event, as do to the two chapters concerning operations off Yugoslavia. The multinational nature of these operations is well served by a multinational analysis. Jeffrey Barlow’s coverage of the naval response to the September 11, 2001 terrorist attacks emphasizes the successful cooperation between the four navies in the immediate aftermath of the attacks. Barlow also notes the often-overlooked importance of differing national rules of engagement (ROEs) that served to limit the Royal Navy’s contribution to maritime interception operations. Robert Caldwell’s chapter provides an extended analysis of the Royal Canadian Navy’s recent experience with interoperability. Perhaps most fascinating were the descriptions of conferences used to coordinate the various national contingents in operations from Haiti to the Persian Gulf. 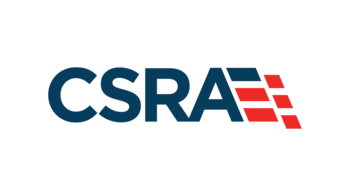 These conferences illustrate the impacts of the full range of interoperability issues: ROEs, doctrine, command and control arrangements, personal relationships, past experience, and domestic political considerations. Caldwell also effectively challenges the conventional wisdom that the deeper Canadian forces are integrated with the U.S. military, the more Ottawa is tied to Washington’s foreign policy positions. In fact, the RCN’s experience with the USN demonstrates that extensive interoperability gives Canadian policymakers more options in international affairs, rather than less. Edward Marolda provides a clear, concise survey of the previous chapters that emphasizes the success of multinational coalitions in operations other than war. Randy Papadopoulos’ conclusion argues for the importance of personal relationships, trust, and time together at sea in developing interoperability. Works on multinational operations are difficult subjects for historians. This book makes an important contribution to this understudied area. The analytical focus on interoperability makes this volume even more unique. While the chapters vary in length, they work together well, which is not always a given in an edited volume. Williamson is a Ph.D. candidate at Ohio State working on a dissertation on Western naval cooperation during the early Cold War.